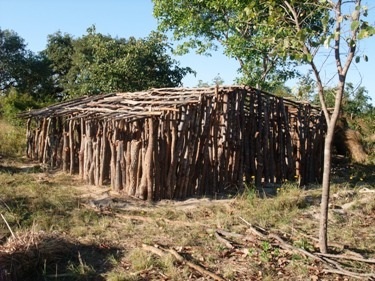 In May of 2009 a WOW team spent two weeks ministering with the people of Chibanga. This community is brimming with excitement because for the first time in many years they have hope. The widows have emerged from mourning are praising God in their songs and dance. After a warm welcome from the women in the community the team was brought to greet the children of Chibanga Community School. The children who normally attend school in shifts were all crammed into the one room classroom eager to meet the representatives from Canada who have helped to build their school. We greeted them with our own songs (sung in Bemba) and announced that we were also there to help build a second classroom to their school. How sweet these children were as they helped us carry bricks, and then sat to watch as our team began to build. Later we met with the widows group. There are 62 members in all and they are a fantastic group. They meet regularly for bible study and sewing lessons. WOW has provided the group with 10 sewing machines which all 62 women share. The WOW team was very excited to announce that we would be having a special party for the widows with gifts of T-shirts, chitengas (wrap/skirt), umbrellas and soaps. We would also host a special meal for everyone in the village in celebration of God’s goodness. We then set out to visit selected widows homes, gathering information for memory books, filled with family pictures and names and birth dates, which were later given as gifts. The widows walked us throughout their village showing us their gardens which they tend as a group with the harvest going to help themselves as well as the orphaned and vulnerable children in the community. Because of the generosity of WOW donors even the youth have begun their own income generating activity. They have built a piggery with their own materials (small tree trunks fastened together to make a frame) and have begun raising pigs. Pig rearing in Zambia has had great success so we anticipate good returns for this investment. The widows will soon begin their own income generating activity of goat rearing. Our goal is that each widow will have their own goat in which to provide milk and eventually meat. So much has happened in this community over the past two years. In the next update I will share with you the story of the woman who first discovered the state of need that Chibanga was in, and about her cry to the Lord for help. Thank you to all of the donors who have given so generously to help this beautiful little community. Please continue to pray for them and their leader, Chief Eleness Chilupula.